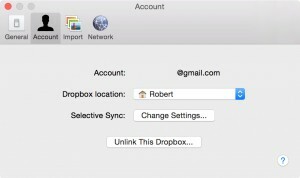 Dropbox is a very popular service that allows us to sync our files with cloud storage. It is compatible with most popular operating systems, from Windows, Linux (Ubuntu, Fedora, Debian), Mac OS X, iOS, Android and Windows Phone. In desktop computers, having our files synced to cloud storage also means that we can get our files synced between multiple devices. Having the same set of files in our devices is extremely handy, especially when we work at multiple locations or travel a lot. The default behaviour of Dropbox is to sync all files and sub-folders inside the Dropbox folder. When someone only has few small files in Dropbox folder, it seems like a good idea to have those files available in all our computers. However, when someone has Dropbox folder with large files in many sub-folders, it might be a good idea to sync only certain sub-folders with certain computers. There are many reasons of doing selective sync. It could be useful when our other machine has limited free storage. New Windows tablet tends to have very limited SSD storage and having unnecessary files means less space for important ones. Another reason of selective sync is privacy. When we sync our computer at work with Dropbox, it does not make sense to sync our personal files to office computer. We can create “work” sub-folder under our Dropbox folder and put everything work-related inside that sub-folder. To choose selective sync, all we need to do is open Dropbox preferences screen, choose Account, then click on Change Settings button for Selective Sync. It will display a list of sub-folders in our Dropbox storage and choosing which sub-folders to sync is as easy as clicking check boxes next to sub-folder name. We can even choose any level of sub-folders, not limited to first-level sub-folder. That’s it. I hope it’s useful.